1. Bring a couple of inches of water to a boil in a medium saucepan with a steamer basket set over it. Place the potatoes in the steamer basket and steam until they are fork-tender, about 18 minutes. 2. 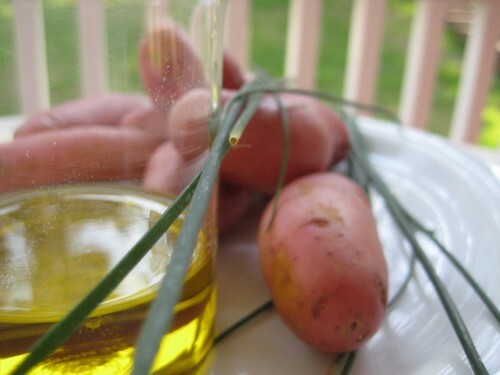 While the potatoes are steaming make the chive oil. Roughly chop two thirds of the chives and cut the rest into 1-inch pieces. Bring a small saucepan of water to a boil and add the roughly chopped chives. Blanche the chives in the boiling water for 1 minute then strain them. Pat the chives dry with a paper towel. 3. Using a small food processor or a stick blender, blend the blanches chives together with the olive oil until a smooth mixture is formed. Strain the chive oil through a mesh strainer into a small bowl, discarding the chives left behind in the strainer. 4. Once the potatoes are tender, place them a serving dish and toss with the chive oil, remaining chopped chives, lemon zest, salt and pepper. Serve warm. Please let me know if you have any favorite potato recipes using new flavors or techniques, I’m always ready to try something new! Later this week: a comparison of different types of pancakes, homemade or from a mix? Yum! I’m with Ben I LOVE POTATOES! 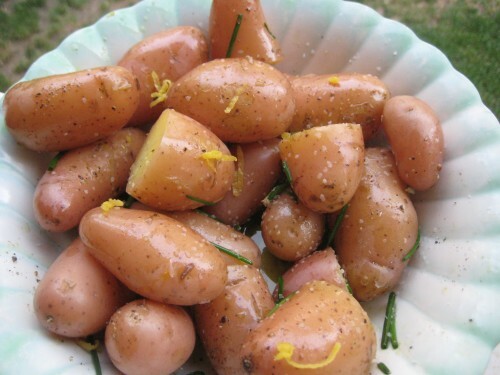 A couple of recipes I love are for Potatoes Rustica, and for roasted herb potatoes. The potatoes Rustica is potatoes and red bell peppers roasted with olive oil and herbs then tossed with penne pasta and parmesan. The roasted potatoes are wonderful in a variety of uses. I just take any potatoes I have, but really prefer red skinned ones. Preheat the oven to 375 or 400 . Scrub and roughly cut the potatoes into a boil. Toss with a small amount of olive oil, salt , pepper, and fresh or dried thyme. Roast until fork tender. I use the herb roasted potatoes in a salad Anna and I dubbed “Tuscan Tuna Salad.” Just toss together some canned tuna, the potaoes, cannelini ( or navy beans), haricot vert or any fresh green beans that are cooked until tender crisp. Drizzle in bit of balsamic vinegar ( like the Italian American cook, Lidia B. does for fresh salad) and toss. Add olive oil if needed. The “chards” of parmesan cheese on top. Crusty french bread ( GF or regular are the perfect addition along with some red wine. One of my favorite summer quick meals to use left over potatoes and/or green beans.